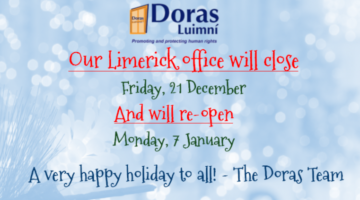 DORAS IS AN INDEPENDENT, NON-PROFIT, NON-GOVERNMENTAL ORGANISATION WORKING TO SUPPORT & PROMOTE THE RIGHTS OF MIGRANTS LIVING IN IRELAND. Information sheets on immigration-related issues, research publications, welcome guides, education resources & templates available. Read more about work on Integration & Anti-Racism, which is one of our policy areas. Other policy issues include Direct Provision, the right to work & anti-trafficking. 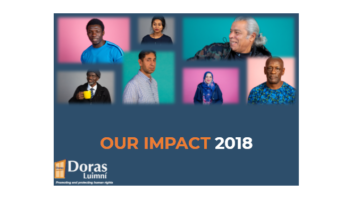 Doras Luimní’s commitment to making a real difference in people’s lives is evident in all of their work. 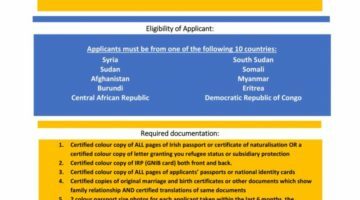 The IRC is delighted to have the opportunity to collaborate with Doras Luimní on the issue of Direct Provision. 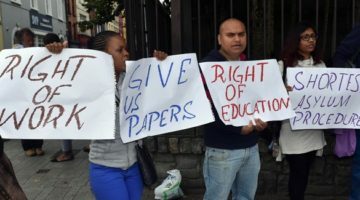 Their Invisible Children exhibition has shone a light on the realities of living conditions in Direct Provision. Without Doras Luimní’s support there is no telling where my children would be today or even if they would still be alive. During the dark days when I was so lonely and frightened and missing my home and my family, Doras Luimní was there. They were a light in the darkness for me. ADAPT Domestic Abuse Services is pleased to collaborate with Doras Luimní on a number of issues related to the rights of migrants, particularly in relation to women experiencing domestic abuse. We also fully support the anti-trafficking outreach work of Doras and have worked with them to lobby for changes to legislation on prostitution. Together we strive for equality and justice for all, regardless of gender or nationality.